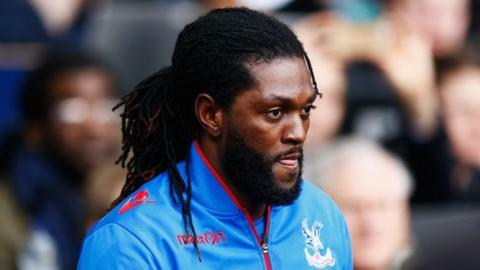 French club Lyon have pulled out of negotiations to sign Togo international striker Emmanuel Adebayor after a 'delayed arrival and desire to play for his country at next year's African Cup of Nations'. Adebayor, a free agent since his contract expired with Crystal Palace, held talks with coach Bruno Genesio but a deal failed to materialise. The Ligue 1 side said Adebayor, who is not eligible for the first phase of the Uefa Champions League, had "delayed his arrival in Lyon" on Friday. "Adebayor also wanted to play the Africa Cup of Nations with Togo at the beginning of 2017, which would have led to an absence of one to two months", the seven-time French champions announced on their website on Saturday. They added that the imminent return of fit-again attacking duo of Mathieu Valbuena and Nabil Fekir has further boosted the club's injury-stricken forward line in the absence of injured Alexandre Lacazette, hence their decision not to pursue the veteran forward. Adebayor's professional career started in France with Metz in 2001 before joining rivals Monaco in August 2003. He boasts 97 Premier League goals after arriving in England back in 2006 to join Arsenal - where he scored 62 goals in 142 games - before spells at Manchester City and Tottenham Hotspur. The striker moved on loan to Real Madrid for six months in January 2011 and helped Jose Mourinho's side win the Copa Del Rey in 2010/11. Adebayor then returned to London with Tottenham where he scored 41 goals in 106 appearances in four years at White Hart Lane before he was released from his Spurs contract in September 2015. He signed for Palace in January, but scored only once in seven league appearances before leaving the club at the end of last season. Despite a difficult relationship with the Togo Football Association as well as national team coaches, Adebayor remains the most important figure in the country's football history. He led Togo to the 2006 Fifa World Cup in Germany and has 29 goals in 63 appearances for his country. So what's Adebayor been up to?